A Synod is a body of representatives of the Church Councils within a defined area. It shall be responsible for carrying out the duties assigned to it by this Constitution. and by direction of the General Assembly. It shall have power to approve such, bye-laws of the Church Councils Within its area as do not conflict with the pro-vision of this Constitution and shall periodically examine their records. It shall adjudicate all references and appeals regularly presented to it by or through a Church Council. It shall appoint a standing Judicial Committee as provided for in Chapter IX of the Constitution (Blue Book). It shall establish, maintain and supervise theological institutions as and when necessary, either of itself or in conjunction with its Church Councils. It shall be responsible for the formation of new Church Councils within its area and for defining their bounds, and for the redelimitation of the bounds of Church Councils, and for the disbanding of Church Councils, all subject to the approval of the General Assembly. It shalt receive and consider. the annual reports of the Church Council within its area, especially, the reports regarding visitation of Congregations of Church Councils. Moderator: Rt. Rev. D. B. Samudre, Secretary/Convenor: Mr. Y. G. Immanuel. Allahabad Church Council It currently has 3 Churches running under it. History: The first seeds of the present UCNI Church in Allahabad were sown in 1836 when a small school was started by the American Missionaries. The first congregation was organised in Allahabad in 1840 by edict of the American General Assembly, of May 1841, the Allahabad Presbytery (Church Council) came into being. In 1852 work was started in Fatehpur and the Kanpur congregation was organised in 1900 and by 1915 it was self-supporting. Integration: The evangelistic work of the United Presbyterian Church in USA was integrated with the work of the Church Council & Institutional work was integrated with the North India Synod in 1956. Since 1966 no grants have been received by the Church Council for support of the Ministers or for other evangelistic work. Bundelkhand Church Council 3 Churches are running under this church council currently. History: The North India Mission of the Presbyterian Church U. S. A. started work in Gwalior in 1874 although it was not officially recognised as a mission station until 1911. Despite much faithful work, it proved a difficult area to evangelise and in 1933 it is reported that the Church was organised for the second time with a congregation of about one hundred, most of whom have come to Gwalior from outside. In 1886 the American Presbyterians extended their work to Jhansi and in 1904, at their invitation, Canadian Presbyterians also started missionary activity, Jhansi was on the edge of the Mass Movement area and in 1905-08 reported 357 baptisms among two Depressed Class groups. The City Church was organised in 1890 and Sipri Church in 1905 by the Americans. The Khrist Prakash congregation was organised in 1907 by the Canadians and later a mission farm of 1200 acre was started. Integration: The Church Council has responsibility for all Evangelistic work. Those schools founded by the Americans are administered by the Board of Education of the North India Synod and are Government aided. Before 1960 this area was part of the Allahabad Church Council but the distance between Allahabad and Jhansi made adequate administration or fellowship difficult. 3 Churches are running under this church council currently. 4 Churches are running under this church council currently. As these two Church Councils share the same history, environment and many of the same difficulties they are reported on together. History: Missionaries of the American Presbyterian Church opened an orphanage in Farrukhabad in 1838 and during the next fifty years extended their work through the villages and main towns of the area. Work was opened in the main centres in the following dates:- Rakha 1839, Mainpuri 1843, Etah 1873, Kasganj 1878 and Etawah 1886. In 1912 the work in the Shikohabad district was taken over from the American Methodists. Integration and Organisation: The evangelistic work of the U.P.U.S.A. was integrated with the work of the two Church Councils in 1956. All institutional work was integrated with the N. India Synod, UCNI at the same date. Until the end of 1965 each Church Council had 20 organised congregations but in addition each of the seven District Superintendents had a number of ‘Ilaqas’ (districts) under his care. The Garhwal & the Kumanyu Church Councils are recently formed Church Councils under the North India Synod of the UCNI. The old property in the Jurisdiction of these Church Councils were integrated into the Punjab Synod of the UCNI which were transferred to the North India Synod in the meeting of the General Assembly of the UCNI by passing of a resolution. History: The Canadian Presbyterians started work in this area about a hundred years ago. In some cases, as in Indore where the Cowley Fathers had opened a mission station, the Canadians continued the work of other Christian bodies. Work among the Bhils was started about 50 years ago but it was in 1936-38 that large numbers of these people joined the Church. Medical work was started in Dhar in 1895, but it was not until 1949 that many Bhils living in the villages around Rajgarh asked for baptism. In 1905 the mission was extended to the Nimar District where there have been a number of converts among Depressed Class groups. In Banswara, a district largely inhabited by Bhils, work was started in 1914. Integration and Administration: The work of the United Church of Canada and the work of the UCNI was integrated in 1955. 2 Churches are running under this church council currently. History: Soon after 1800 A. D. the first missionaries of the London Missionary Society started work in the area which is now known as Gujarat and in 1819 the first station was established in Surat. In 1841 the Presbyterian Church: in Ireland sent its first missionaries to Bombay where, with the help of Church of Scotland missionaries, work was started among Gujarati speaking people and later was extended northwards. In 1846 the London Missionary Society handed over their station in Surat to the Irish Presbyterians and in 1859 all other work which they had started in the area was also handed over. Integration: The first steps towards integration were taken in 1947 and negotiations started then culminated in the final integration in 1961. In 1956 the Church Council set up a body known as the General Board of the Gujarat Church Council with power to take over all work entrusted to it by the Council. The General Board is made up of 24 members appointed by the Council, half of whom must be members of the Council. In practice the Council entrusts all institutional work, the administration of property, and certain evangelistic projects to the Genera] Board, but in questions of policy concerning evangelism the final decision rests with the Church Council. All ministers serve directly under the Council and are stationed and transferred by its Executive Committee. History: The first missionaries of the United Presbyterian Church of Scotland reached Beawar in 1860 and by the end of the century had started work in 12 centres of Rajputana including Ajmer, Nazirabad, Jaipur, Jodhpur and Udaipur. Much of Rajasthan is an arid desert area and when the Monsoon fails the result is famine. There were severe famines in Rajputana in 1869, 1875 and 1900 during which several million people in the area are reported to have died of hunger, bubonic plague and cholera. “In these famines the missionaries played a large part in the work of relief, sometimes using resources provided by the Churches some- times on behalf of Public Authorities. Many orphans were taken into shelter, and these are in many cases the ancestors of members of the Church”. At one period more than 2000 orphans were in the industrial training schools in Ashapura and many of these children were later settled on land in Piploda, Ashapura and Balakpura, which the Govern, ment gave to the early missionaries for this purpose. In 1927 the present Rajasthan Church Council was organised as a separate Church Council of the UCNI. Integration: Integration between the work of the Church of Scot- land and the work of the Church Council was finalised in 1960 when responsibility for both evangelistic and institutional work was given to the Church Council. It currently has 2 Churches running under it. History: The American Presbyterians started work in Ambala in 1849 and in Dehra Dun in 1853. It is known that there were also Christian groups in Morinda and Ropar at an early date. The early growth of the Church followed much the same pattern as in other parts of the Punjab except that the area was less affected by the early Mass Movement among the Church people. In 1910 the New Zealand Presbyterians opened a hospital in Jagadhri and the beginning of an indigenous Church there came in 1916 when the first convert was baptised. Integration: The evangelistic work of the New Zealand Pres-byterians was integrated with the Church Councils in 1953 and that of the American Presbyterians in 1955. The insti-tutional work of both Overseas Churches is integrated with the Punjab Synod. History: The Presbyterian Church, U. S. A , started work in Jullundur in 1846. Development during the early years was largely due to the devotion of the Rev. Golaknath, the son of a Calcutta Brahman Tea Merchant who, having studied under Alexander Duff, was forced to leave home due to his leanings towards Christianity. He was baptised in Ludhiana in 1837 and later became the first Indian to be ordained in the Punjab. In 1867 a second centre was opened in Hoshiarpur, where the pioneer was another of Duff's converts, Kali Charan Chatterjee. The first churches to be built in the area were those in Jullundur City and Gorewaha both of which bear the date 1873. The history of the growth of the Church in the Doaba area is similar to that described under Gurdaspur. In 1939 Doaba was constituted as a separate Church Council under the Punjab Synod and in 1957, as a result of integration, the Church Council assumed sole responsibility for all evangelistic work. The integration of institutions in the area took place at the Synod level. The Christians in Adampur District belonged to the N. W. India Mission until 1947, when they transferred their membership to the UCNI. Integration: The evangelistic work of U.P.U.S.A. is fully integrated with the UCNI at Church Council level. The institutional work has been integrated at Synod level. History: Mission work was started in the year 1855 in Sialkot by both the Established Church of Scotland and the Ameri¬can United Presbyterians. During the ensuing years the Americans extended their work South-eastward as far as Batala while the Scots opened a mission station in Chamba in 1863 and in Jammu in 1892. After the partition of India and Pakistan in 1947 the Church of Scotland decided to integrate the congregations of Jammu and Chamba with the Punjab Synod of UCNI. Those 13 congregations of the American United Presbyterians, which remained in India, continued as part of the Sialkot Presbytery until 1956 in which year they also were integrated with the UCNI Punjab Synod, and the present Gurdaspur Church Council was formed. Integration: The Evangelistic work of both the Church of Scot- land and the U. P. U. S. A. is fully integrated with the UCNI at Church Council level. The institutional work of both churches is integrated at Synod level. 5 Churches are running under this church council currently. History: Ludhiana was the first field of the American Presbyterians who started work there in 1834. By 1886 there were seven churches and 20-Ministers (including 7 Indians) in the Ludhiana Presbytery which at that date covered the whole Punjab. The present Ludhiana Church Council was formed in 1965 and is made up of Moga and Ferozepore Districts (formerly Ambala Church Council) and Ludhiana District (formerly Doaba Church Council). Integration: The evangelistic work of the U. P. U S. A. Was integrated with the Church Council in 1950 and all institutions were integrated with the Punjab Synod. All grants from overseas to the Church Council for evangelistic work were discontinued in 1966. History: William Macfarlane, a Church of Scotland missionary started work in Darjeeling in 1870. The present Church Council includes a congregation in Sikkim where the Church building was dedicated in 1936. Many of the Church Council members live at the foot of the mountains in the Jalpaiguri district where there are four congregations whose members are largely workers on the tea estates. Integration: Final integration between the work of the mission and the work of the Council took place in 1963. The administration of institutions is the responsibility of the Council who has delegated the day to day administration to Educational and Medical Boards elected by the Council and to Managing Committees. IT IS A PRESBYTERIAN CHURCH COUNCIL AFFILIATED TO UNITED CHURCH OF NORTHERN INDIA, A BODY HAVING COUNCILS THROUGHOUT THE DIFFERENT PARTS OF INDIA. 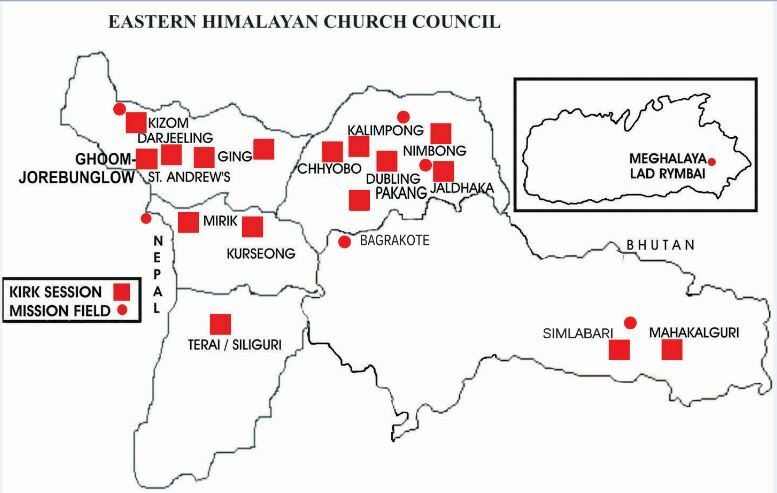 EASTERN HIMALAYAN CHURCH COUNCIL HAS MORE THAN 106 CHURCHES IN DIFFERENT PARTS OF THE DISTRICTS OF DARJEELING, KALIMPONG AND JALPAIGURI, MOSTLY IN RURAL AREAS. A SELF RELIANT COUNCIL HAVING BRANCHES IN COAL FIELD OF MEGHALAYA AND EASTERN BORDERS OF NEPAL, IS AN EVANGELICAL CHURCH LED BY 30 PASTORS AND MORE THAN 262 ELDERS. 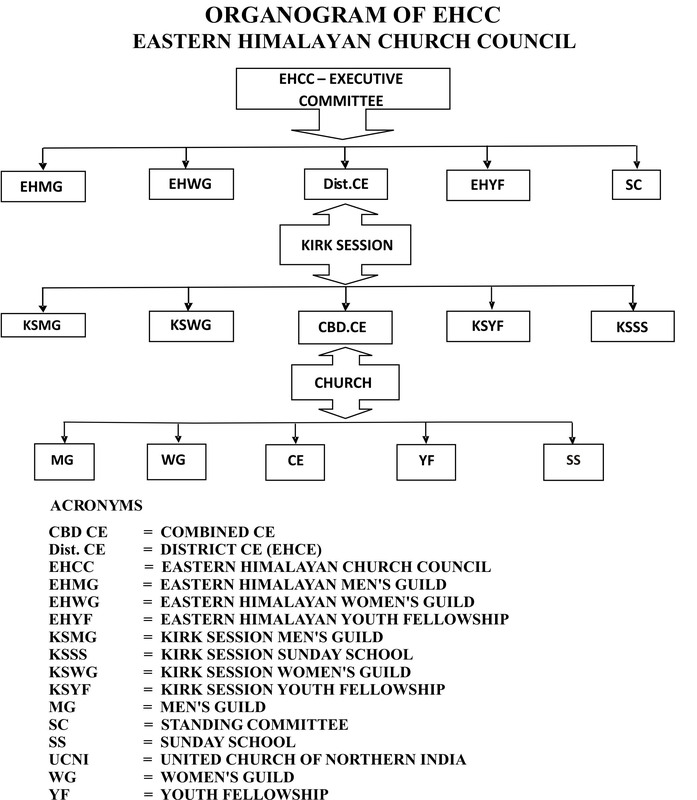 Group of Churches of a specific region under the Eastern Himalayan Church Council constitute bodies called Kirk Sessions for decentralisation of power and responsibilities and function accordingly. There are 16 Kirk Sessions under EHCC and the Churches are represented by these Kirk Sessions to the EHCC in its Executive Committee, different standing committees and the general council body. Each Kirk Session has one Moderator as the President of the Kirk Session to look after the Churches and activities under it. Moderator is an ordained and appointed Minister of the EHCC and assigned to one or many Kirk Session(s). He is assisted by other ordained and appointed Ministers as Assistant or Associate Pastors to look after the spiritual and administrative well being of the Church and its members. All Pastors are ordained after receiving theological degree and requisite internship. Ministers are assisted by Elders elected by the Church members for every three years as representatives to look after the Church. Each Church, Kirk Session and Council functions in accordance to the Blue Book of the UCNI and Bye-Laws of EHCC. The Church constitute a body called Chhoti Panchayat, the Church Committee and the group of Churches constitute Badi Panchayat, the Kirk Session . Around 1869 the Church of Scotland started it’s religious and charitable trust in the province of Bengal. The Foreign Mission Committee of the Church of Scotland sent its missionaries to India and finally in the areas of Eastern Himalayas. In 1970 Rev. William Macfarlane came to Darjeeling from Gaya. He was followed by other missionaries and they ventured to different localities of the area and established dispensaries, schools and Churches. Eventually its work was extended to the terai and plains of Jalpaiguri. At different times various sects and denominations in the Christian religion originated mainly on the basis of diverse convictions and missionaries and priests belonging to different denominations started propagating their faith, practices of doctrines among the people under different names suggestive of their places of origin and specialists of faith, practices and doctrines and every such denomination is also commonly known as Church. The Churches established in different areas were put under Missions of respecting areas like Darjeeling, Kalimpong etc. Later these Missions together were united to constitute Eastern Himalayan Church Council a larger body under the FMC of Church of Scotland. In or about 1924, the Presbyterian Churches and Congregational Churches started in the Northern parts of India united to go in one organic unity to form a now denomination called the United Church of Northern India (UCNI). The said association UCNI has got it’s own constitution known as “Blue Book”. At that time the Missions of Church of Scotland became its member and the Eastern Himalayan Church Council with its headquarter in Darjeeling was formed as a Church Council of the U.C.N.I. The Church of Scotland acquired various immovable properties in different part of North Bengal including the District of Darjeeling and Jalpaiguri for their religious and charitable works. The Church of Scotland Trust, a body duly incorporated in Scotland and under the Church of Scotland Trust order confirmation Act 1932 and also duly incorporated under the Indian Companies Act 1913 and constituted as a Trustee on behalf of the Church of Scotland. EHCC having it’s headquarters at Darjeeling used to administer the properties belonging to the Church of Scotland Trust in the District of Darjeeling and Jalpaiguri. In or about 1970 a new denomination called the Church of North India came into being who claimed that the following six denominations gave with to C.N.I. The Baptist Churches in Northern India, The Church of Brethren in India, The Disciples of Christ Church, The Church of India (the Church of India, Pakistan, Burma and Ceylon which was originally known as the Anglican Church or the Church of England in India), The Methodist Church (British and Australian conferences) and the United Church of Northern India. The merger/amalgamation is absolutely illegal, invalid and imperative in law and has been challenged in different courts of law. At no point of time the CNI had any unity of faith with any of the six denominations and specially with that of UCNI in relation to creed, confession, formulation etc. The congregation of EHCC came to realise the fact that they had no spiritual compatibility in the new set up in the matters of faith,worship, practice and tradition since they believed in the order and faith as propounded in the constitution of UCNI called Blue Book and whereas CNI has introduced system which were quite alien and averse to the Presbyterian system. These facts and circumstances in or about 1st May 1993 the members of the EHCC decided not to continue relationship with CNI and accordingly by a resolution declared and disassociated themselves from CNI and decided to reaffirm to their old Presbyterian faith and order and revive and rejuvenate their time honored old traditions and heritage both spiritual and temporal under their original organisation that is UCNI and also to revive their previous identity as the EHCC. EHCC is a registered trust under the Trust Act and has its headquarter at Siliguri. American Congregationalists first came to Ahmednagar in 1831 and the ‘First Church’ was founded there in 1833 which holds the claim to be the mother Church in Maharashtra. Currently around 17 Churches are running under it. 7 Churches are currently operating under this Church Council. History:Two missionaries of the American Board, having been turned away from Bengal, began work in Bombay. They were followed in 1823 by a member of the Scottish Missionary Society and in 1829 by Dr. J. Wilson, one of t e most famous of the Scottish pioneer missionaries. The Church of Scotland opened work in Poona in 1834. In 1924 Christians of both Presbyterian and Congregational traditions came together in the UCNI. Integration: The evangelistic work of both the American Marathi Mission and the Church of Scotland was integrated with the Church Council in 1950. The Wilson Education Society is an autonomous Board integrated with the General Assembly, UCNI and responsible for Wilson College and two ex- Church of Scotland High Schools in Bombay. 60 Churches & 140 house fellowships are currently operating under this Church Council. History:The American Presbyterians first opened their work in Kolhapur and later ventured further south to Kodoli in 1880 and Sangli around 1886. Miraj Hospital was founded in 1896. Integration: In 1955 the evangelistic and institutional work of the American Presbyterians was integrated with the UCNI at the Church Council level. Missionaries are asked for and stationed by the Church Council and are subject to C. C. regulations in the same way as others. 4 Churches are currently operating under this Church Council. History:The Christian work which, over the years, has developed into the work of the Nagpur Church Council was started in 1837 by a group of Army officers who, in 1840, built a hall for social service, education and worship. These officers later tried to gain the interest of a Missionary Society to carry on the work they had started and in 1843 the Free Church of Scotland sent Stephen Hislop to Nagpur where he opened a college in 1844. Medical work was started in Nagpur in 1886 and shortly afterwards in two other centres. The work of the Church has been largely built up around its educational and medical work. The present Nagpur Church Council, which was organised in 1929, was further expanded in 1959 when the congregation in Seoni, which had previously been connected with the United Original Secession Church in Scotland, was received into the UCNI. Integration: The evangelistic and institutional work of the Church of Scotland was integrated with the work of the Indian Church at Church Council level in 1958. Mission-aries all serve under the Church Council and are stationed by it.